Spatial Analysis—With the Enrich Layers tool, you can now select a group of data variables (data packs) or individual variables from each group. You can map the results from the Summarize Data tool using the new proportional symbols and get better visual clues for understanding your organization’s data. We’ve also added a new tool, Find Existing Locations, which allows you to query both spatial and nonspatial attributes in your data. And finally, you’ll now see the consumption of service credits ahead of time for Enrich Layers and Create Drive-Time Areas. Network Analysis—We’ve reduced Multi-Vehicle Route service credits usage by 50 percent. Content has been updated and enhanced for India and Thailand. Live traffic is now available for visualization and analysis in Argentina. The Location-Allocation service is in beta. Developers can include this service in their applications, and ArcGIS for Desktop users will see it as one of the ready-to-use services. There is an option to use live traffic in the Directions tool, including Drive Time Areas, Finding Nearest, and Summarize Nearby. 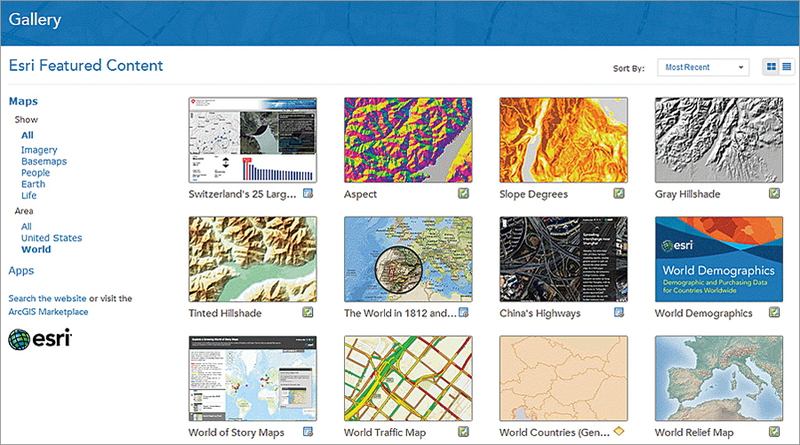 The Gallery has been redesigned so that now you will see an Esri featured content section, as well as your organization’s own featured content section. In addition, ArcGIS Online for Organizations subscribers will now see items they’ve designated as a favorite in their My Favorites section. The Gallery also includes better tools for sorting and filtering items. You can add items to your favorites that you find in search results or the Gallery or that you’ve added to your content. You can view your favorites in a new My Favorites section of the Gallery and search your favorites to add layers to your map. In addition, when adding layers to your map, you can search for layers from your favorites. You can change the URL of an ArcGIS for Server service layer you’ve moved to a different server by editing its details.